The brilliance of Amorphis is their ability to intertwine several complex themes. Even before listening to the music, the album art and title are intricate fusions of multiple abstract concepts. The Queen of Time is a similar name to that of a previous album, The Beginning of Times. This is almost like a self-aware breaking of the 4th wall. The melodic music of their past is bleeding through into this futuristic new record, which was heavily influenced by trance and other modern electronica. The concept of time is clearly a deep rabbit hole, especially in the hands of creative masterminds. Amorphis are masters of Nordic history and fantasy, known for their symbolic lyrics of timeless archetypes like the sky, mountains, animals, family, and even royalty. The regal connotations of a queen fit with musical style of this album. On top of sophisticated opulence, a queen also evokes the divine feminine. The lyrics speak of mothers, daughters, sisters, and of course, majestic queens. In an interview with Loud TV, singer Tomi Joutsen explains how women, nature, and other themes are celebrated in this new album. The duet with female singer Anneke van Giersbergen is another example of this. Her performance in Amongst Stars is stellar. This single seems to be about mortality, like an earlier track, Reformation (The Beginning of Times, 2011). Both songs encourage facing the inevitable fate of death, not with fear, but with grace and dignity. Another single, The Bee, seems to reference the same traditional Nordic literature which has always inspired the band since their inception. In Rune XVof the classic Finnish epic, the Kalevela, the vanquished hero Lemminkainen was brought back to life when his mother healed his mortal wounds with honey. This story is more about Lemminkainen’s wife and mother mourning for him, and less about the hero himself. Again, female energy seems to permeate this music. So too does the imagery of nature, especially bees. This carry-over is apparent in Honeyflow, a bonus track exclusive to the Japan release. Imagery of bumblebees and death are also reflected in the album cover art, with a honeycomb fractal superimposed over a skull. Upon closer inspection, viewers may find insect bodies on the skull itself. Other hidden symbols include Ukko’s Hammer, a traditional Finnish motif which has also been featured on previous Amorphis albums. Like nature itself, it’s difficult to describe one aspect of this album, without explaining its relationship to other elements, or even to the complete whole. Tomi Joutsen’s deep voice is so sultry that it has been compared to the sensuous, low pitched bass of Peter Steele (Type O Negative.) It is true that Joutsen’s vocals are resonant and sonorous. However, it is his thunderous, powerful screams that steal the show. He growls with the same ferocious roar of a wild predator. Like fine wine or whiskey, his lush voice deepens and matures with each new release. This is especially apparent in the heavier tracks on the album, such as The Daughter Of Hate. The guttural vocals, distorted guitars, and urgent tempo all converge to provoke a feeling of overwhelming rage. Folk songs and symphonic orchestration play a major influence, as well as pop and even trance music. 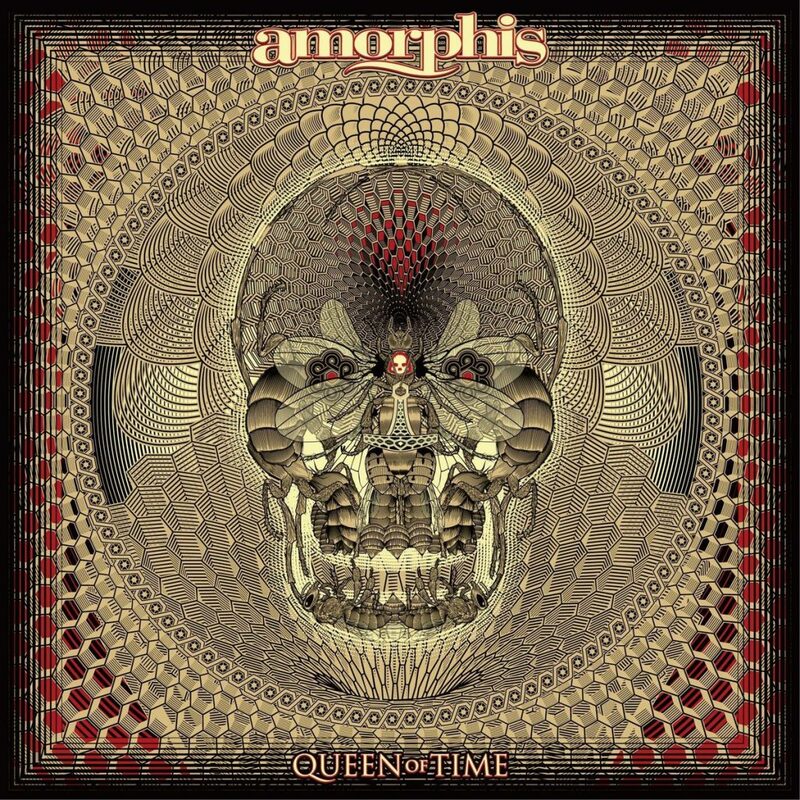 As mentioned before, Amorphis appears to become progressively more melodic with each release. This is their most epic, orchestral record to date. The band still retains a certain Middle Eastern flourish to their guitar riffs, just like their early brutal death metal releases. Different and yet the same, Amorphis lives up to their name. Similarly, the new album Queen of Time is as majestic and classic as the name implies. The titular queen might reference a queen bee, and all that ever was or ever will be, are but drones in her hive, making sweet honey for her consumption. This music can be beautiful one second and scary the next, just like a bee can be a gentle provider or a fierce stinger. Many bands implode under their own egoism, unable to take constructive criticism and honest feedback. Amorphis, on the other hand, have been thriving for decades, partially because of the guidance of lyricist Pekka Kainulainen(Artist, sculptor, writer) and producer Jens Bogren (Dimmu Borgir, Dark Tranquillity, Soilwork). Their input steers the band in the right direction, with a sound that is objectively cohesive and professional. The complex versatility of Amorphis is enormously impressive. Their artistic vision makes connections between their new and old songs, between heavy metal and virtually any other musical genre, between a fantastic land of myth and our real world. Amorphis are as enterprising, adventurous, and fearless as ever. Even though this music is drastically different, I sense the same rebellion, curiosity and innovation that was present in their seminal albums, like The Karelian Isthmus, and Tales from the Thousand Lakes. Multifaceted, complex, and beautiful, Amorphis are a rare gem of a band. Find the new album and the rest of their discography on Nuclear Blast. I am awestruck by the cosmic, celestial imagery in this album. Four stars out of five!